Can you spot the typo? As reported by the New York Times (may require a subscription), this is a poster for a gathering of what might appropriately be called “evangelical atheists”, that is, atheists of the Richard Dawkinsesque sort who think that theism is intrinsically bad and therefore something vigorously to be opposed. 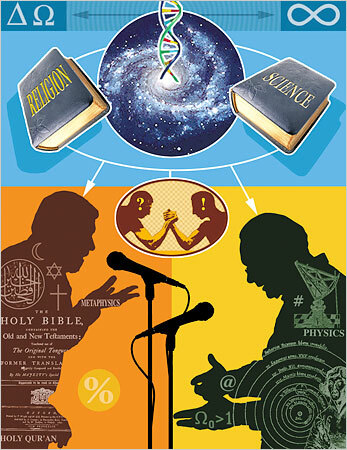 They’re quite obviously trying to convey the idea that science and religion are fundamentally at odds (note the two figures arm-wrestling in the middle) and that science is better because it gives us real answers (!) rather than mere speculations (?). What’s funny about this is that whoever put the poster together is clearly either (a) careless, (b) has an inexcusable (given their profession) ignorance of the Greek alphabet, or (c) can’t be bothered to get informed about theistic ideas and to represent them accurately. Of course, those aren’t mutually exclusive. Spotted the typo yet? It’s in the upper-left hand corner. It’s supposed to be an Alpha (Α) and an Omega (Ω), the first and last letters of the Greek alphabet, signifying that God is the first and the last, the beginning and the end. Just finished Keith Ward’s Pascal’s Fire: Scientific Faith and Religious Understanding. Thanks for the reference, Tom. Hopefully I’ll have a chance to look at Ward’s book before next year’s summer seminar. Hey, Jeff. There is one possibility regarding “Teftaments” that might nullify it as a genuine typo. It occurs in what appears to be a reproduction of a title page from an early English version of the Bible. Well, as you may know, English draws a lot on German and the German’s used to represent their ‘s’ with a figure that looks very close to ‘f’. That raises the possibility that the ‘f’ in “Teftaments” is not a typo but an accurate reproduction of the original. Can anyone out there confirm or refute this hypothesis? Okay, I’ve confirmed that “Teftaments” is not a typo. It’s from the title page of the 1772 edition of the King James Version of the Bible. Note that the representation of an ‘s’ in the middle of a word with an ‘f’-like symbol occurs several other times on the page, as in “Transflated”, “Revifed”, “fold”, “Paternofter”, and “W. Jackfon”.